NXT-Dx offers state-of-the-art and scalable immunoassays, allowing to screen for 96 markers in 92 samples in parallel at affordable cost. Imagine being able to quantify 92 proteins in just one microliter of sample without compromising either data quality or performance. This is now possible. Conventional immunoassays have been unable to scale due to increasing antibody cross-reactivity when more and more assays are run simultaneously. Proseek Multiplex by Olink is a truly scalable immunoassay generating high quality data even in highly multiplexed format. 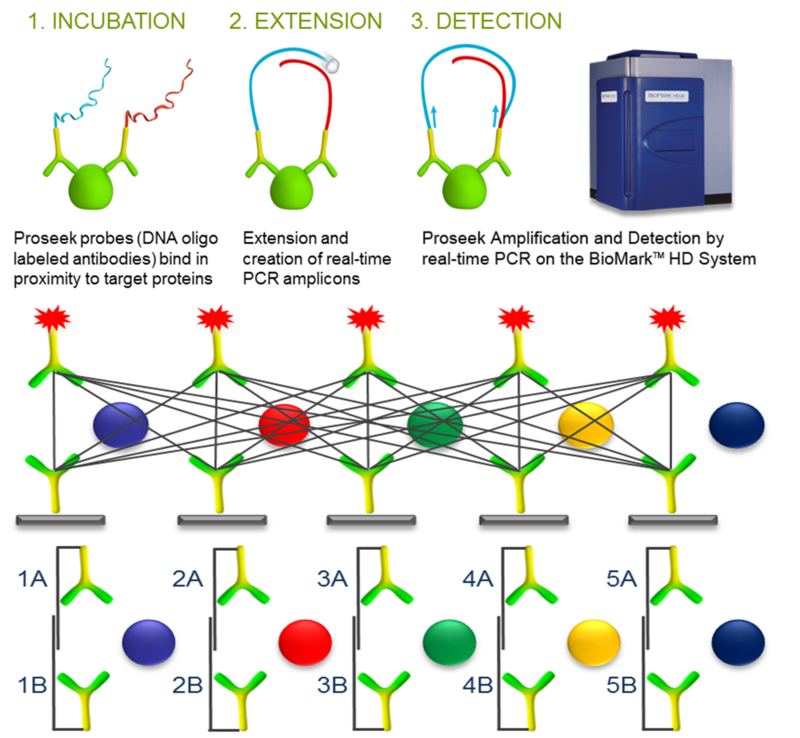 Our multiplexed immunoassay services are based on the proprietary Proximity Extension Assay (PEA) technology developed at Olink Biosciences. PEA has a major advantage over conventional multiplex immunoassays in that only correctly matched antibody pairs give rise to a signal. PEA is a homogeneous assay that uses pairs of antibodies equipped with DNA reporter molecules. When binding to their correct targets, they give rise to new DNA amplicons each ID-barcoding their respective antigens. The amplicons are subsequently quantified by high throughput real-time PCR. With this service NXT-Dx can provide accurate quantification below picogram per milliliter levels even in small samples from, for example, needle biopsies or micro dialysis. This minimal sample consumption makes this service especially suitable for retroactively mining precious biobanked serum samples for new multivariate biomarker signatures.